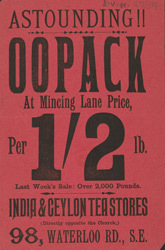 By the 1840s Indian tea was regularly being shipped to Britain. Tea plantation estates covered large portions of India, from the Himalayas to Darjeeling. After the collapse of the coffee plantations in Ceylon in 1867, the region shifted its base to tea production. The British market now had a large variety of teas to choose from and different flavoured specialities became fashionable at different times. Oopack is a region in China which produces a strong black tea.